Sushi and I go way back. I once made my own sushi (using my Nintendo DS with the Personal Trainer Cooking Game) way back in the day. I’m talking at least 6 years ago. I was a skilled little kid and that cucumber avocado sushi came out awesome! Then just a few months ago I tried making my own sushi again. This time without a guide. Well let’s just say, I screwed that one up, and it turned into my Macrobiotic Sushi Bowl instead. Remember that one? 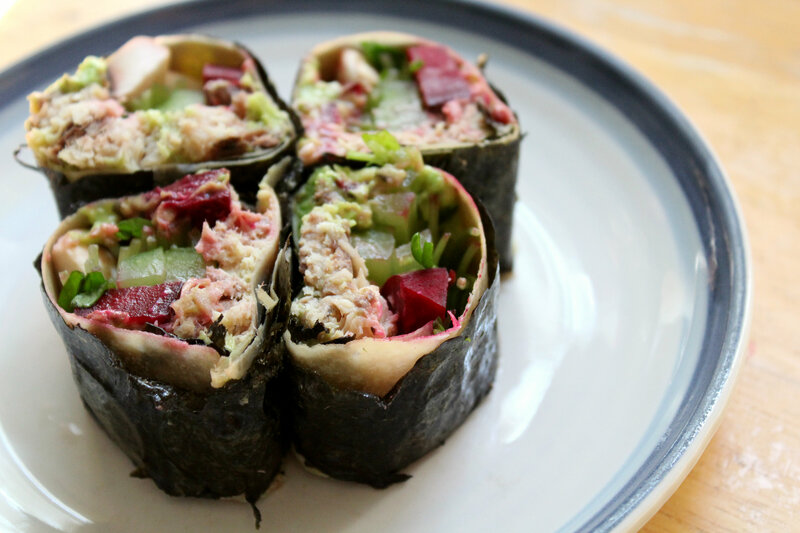 From that day on I was determined to nail the traditional sushi roll some way some how. A few weeks ago I did just that. Except I can’t really call it traditional. This sushi has no rice, no grains at all and it topped with salsa. And there is no raw fish here, only cooked sardines! Raw fish…now that is scary…and not safe in my opinion. Now I could have made this vegan, but no, I wanted amp up the protein. I also wanted to amp up the fat so I included avocado too. It really was a random roll of ingredients that I prayed would taste good together. Sardines, avocado, raw beets, celery, sweet pea shoots, and mushrooms. And topped with my favorite salsa mind you. I had an open jar that needed to get used so, what the heck! 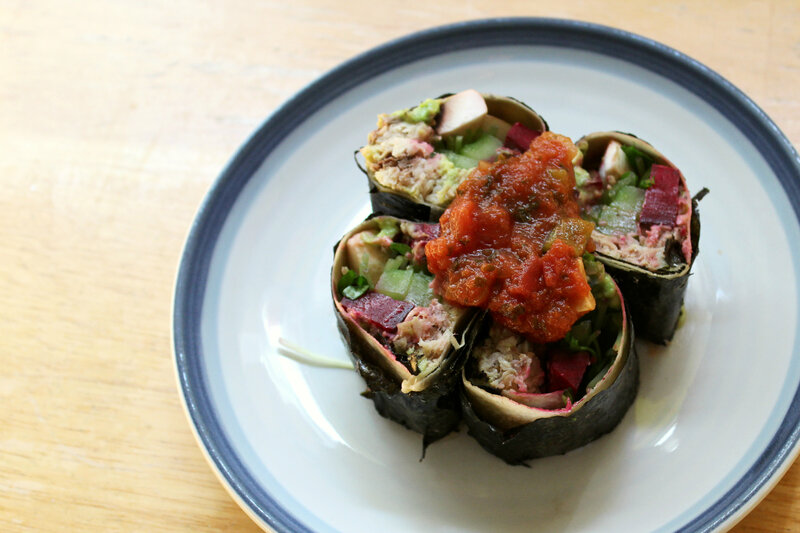 Paleo, Mexican, Asian Sushi for the win! Now what did I use for the wrap? 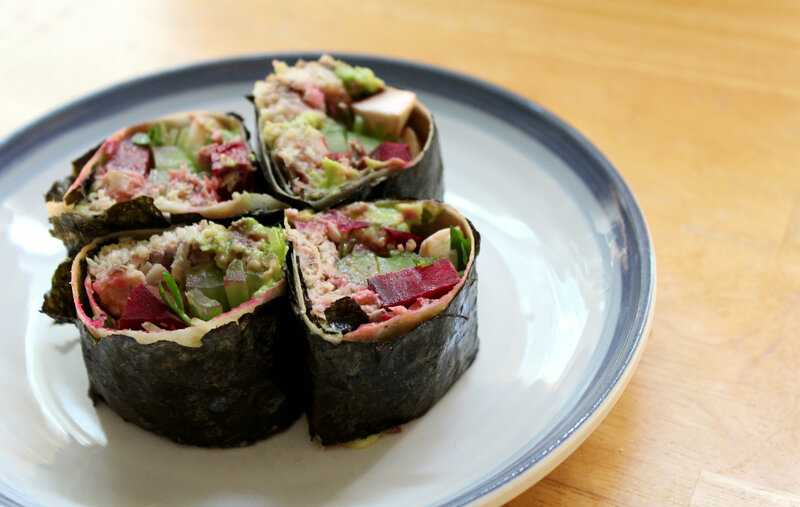 The one, the only, PALEO WRAP! It makes a comeback! This coconut creation is so unique and mimicked the perfect “rice” without being a spilling mess. 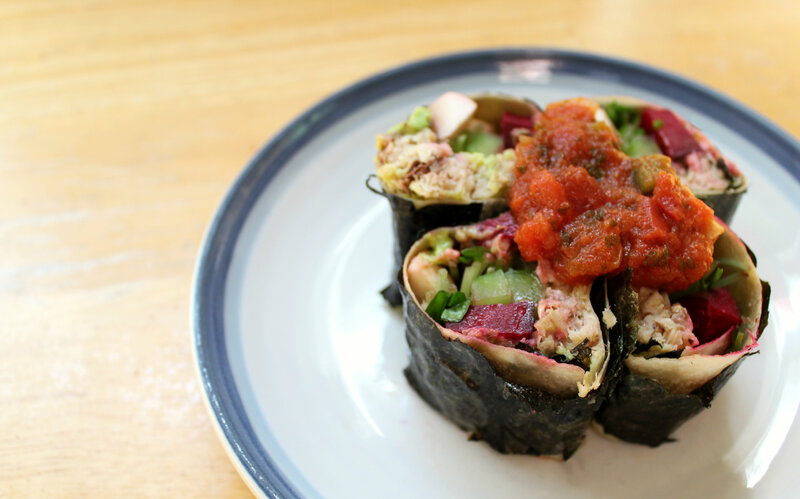 So actually I guess this is a Paleo, Mexican, Asian, Thai Sushi roll…all with the Rebecca flare! So am I now a sushi convert? Eh, it still takes a lot of patience, I’m not going to lie. But at least I can cross this one off the recipe bucket list! What’s next on the docket? I still have to make my own almond milk finally, as well as hummus and bars! Those seem to be easy though, unlike the infamous sushi. 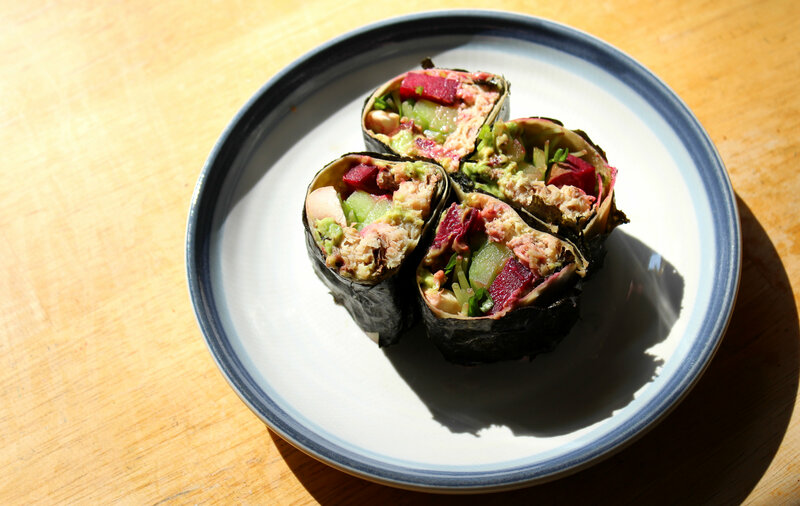 + On a large plate, place your nori down, wet it lightly with water, then your paleo wrap on top. Next spread the avocado mash in a think layer on the top of one half of the wrap. + Next place your sardines down on the line, the celery, beets, shoots, and mushrooms. + Wet your fingers and carefully roll the sushi, very slowly, and very patiently, keeping all the goods in with your fingers. Continue to wet finger tips as needed. Once you get the roll, seal the seam with a bit more water. + Now with a wet, sharp (very sharp) knife, carefully cut the roll into sushi pieces. I got 6 (only photographed the 4 inner ones for prettiness-sake). The last step is to get your hands dirty and dig it! Sushi is messy, but that’s the point or at least it is for me! Unless you get super skilled and show off your chop-stick stuff the whole roll in your mouth skill. But that’s cocky. I use my hands and don’t care if I get it all over. I worked hard for this roll so I am going to enjoy it any way I damn please! + Have you conquered the sushi roll? + Why do they call it Asian Fusion? Why don’t they call things Mexican Fusion or Indian Fusion when combines cuisines? 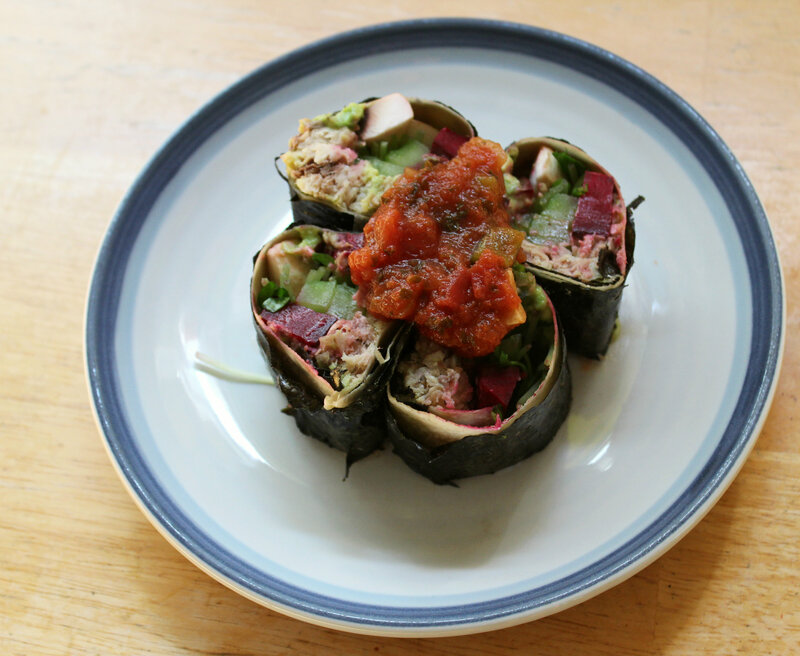 Finally I have a great recipe to share with you using those awesome Paleo Wraps I got a few weeks ago! Let me start by saying, I am so glad I bought them! They are incredible! I thought they would be inflexible and break, or even just taste really nasty, but I was so wrong! O Julian’s bakery is my new best friend! 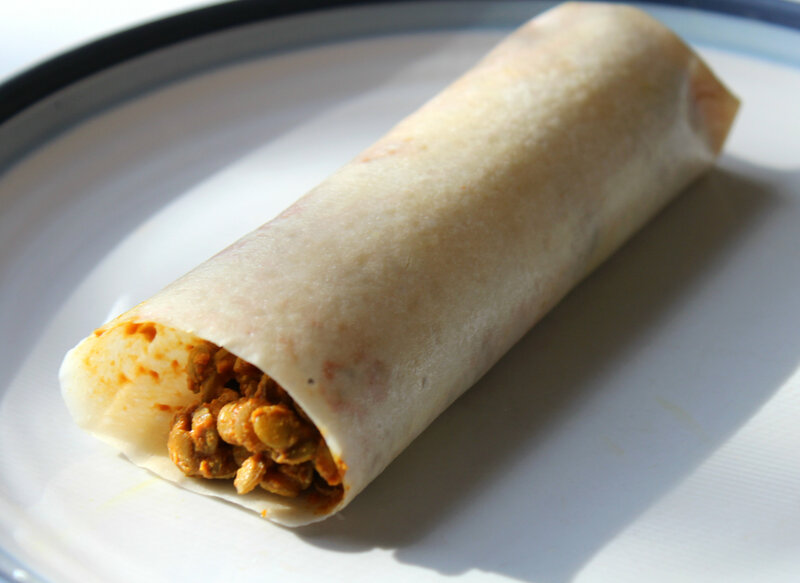 The wraps are totally flexible and when you add something hot to it, the wrap basically “melts” on to the filling and creates the perfect burrito! It even stays closed when you wrap the baby up! I was worried about this after many failed sushi rolling attempts. 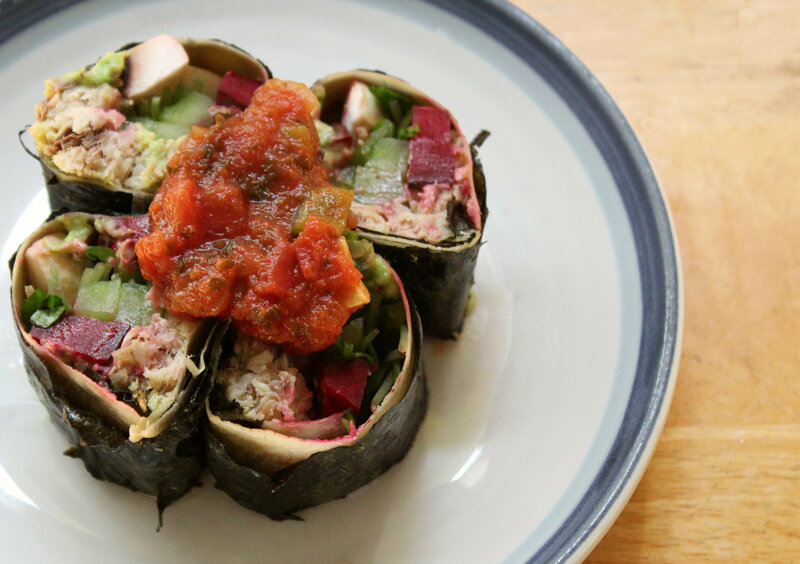 The wraps are made out of 3 simple ingredients which as all coconut! Coconut meat, coconut water, and unrefined virgin coconut oil! They are organic, gluten-free, grain-free, egg-free, salt-free, dairy-free, paleo, sugar-free, vegan, low-carb, raw, soy-free, and yea, basically amazing! You know, I should have posted this for Cinco de Mayo, but I didn’t. Burritos are Mexican right? Well, I am always late with this stuff anyway, what’s new! 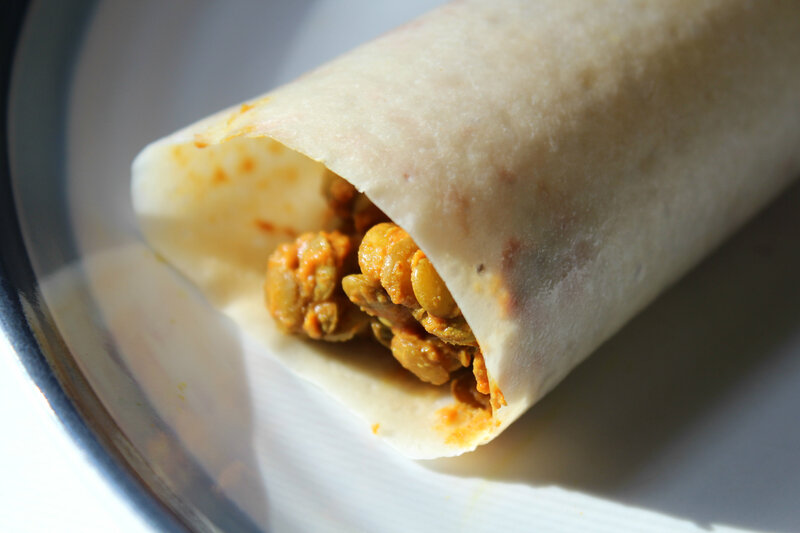 So for the filling of my burrito I used lentils (not paleo, haha! I ruined it), nooch, tomato paste, and sourkrout! Crazy combo that tasted so amazing. The slight coconut taste of the wrap even worked well with it giving it a slightly sweet touch. Perfection! + In a small sauce pot, bring cook your lentils according to directions. When they are done, add in the nooch, tomato paste, and spices. Stir to combine. 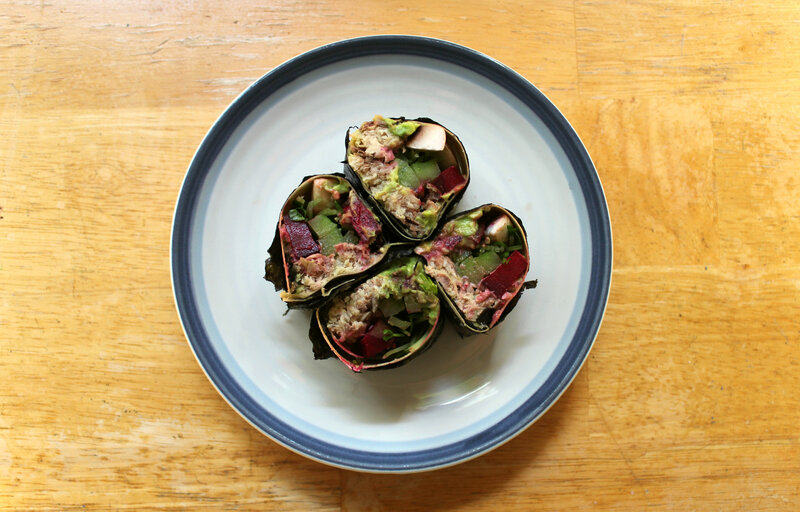 + Lay out your paleo wrap on a plate and spoon on the lentil mixture on one half of the wrap. Then place your sourkrout on top of the lentil mixture. + Now roll the wrap up and make a burrito! It will stick together, just place the seam side down for a minute and let it warm up. 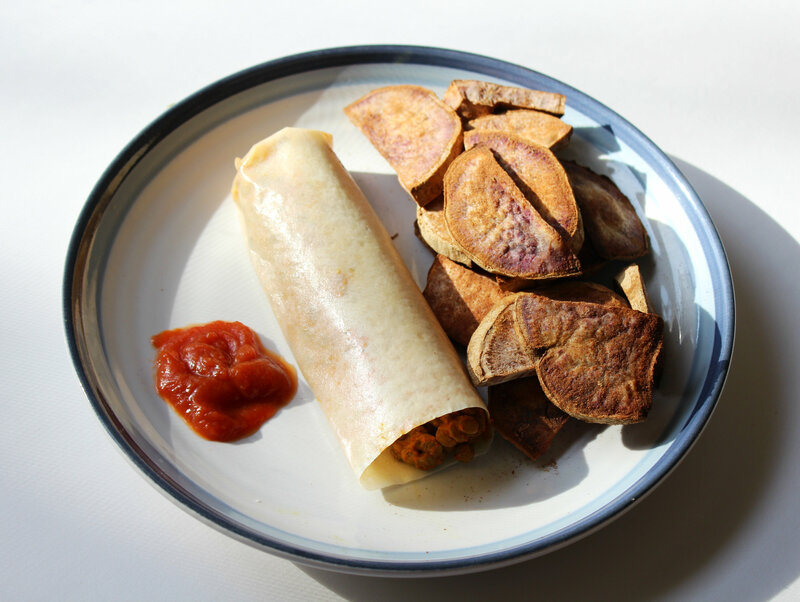 I served my delicious wrap with a side of baked cinnamon Okinawan Sweet Potato Chips! (And some Nomato!) Yum, yum, in my tum. Haha yes I just said that 😉 But hold on I have some important Gluten-Free Challenge info for you too! Writing up this post, I thought about Chipotle. And then I though about how people think they can get safe gluten-free food there if they choose a burrito bowl or corn tortilla. Well WRONG! I came across this article a few weeks ago and it is so true. Yes, cross-contamination is just blinking with big bright letters all over that place. 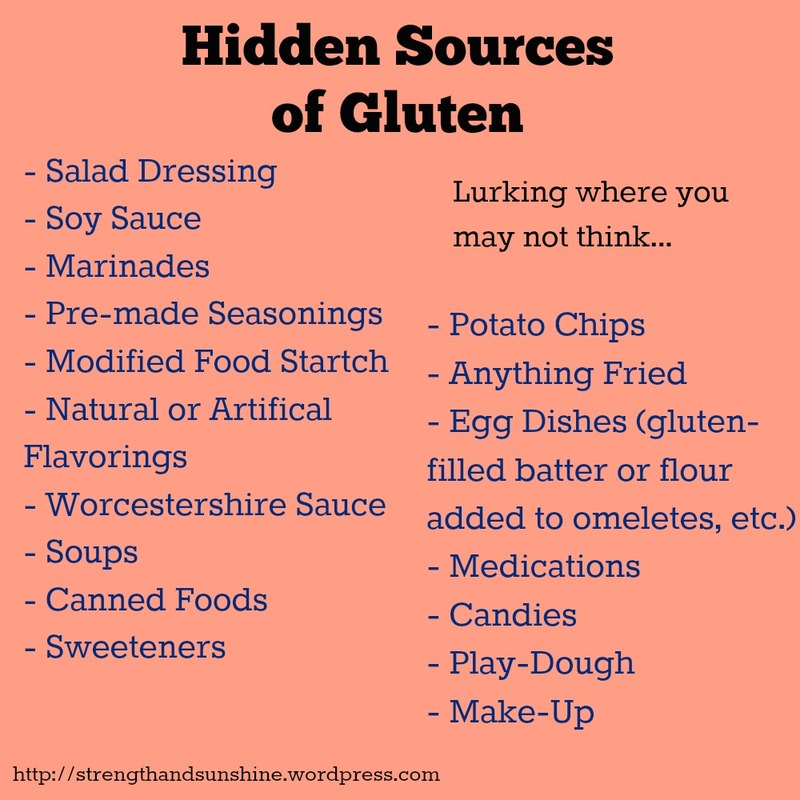 That also got me thinking about all the hidden sources of gluten people might over look when they are new to being gluten-free. So I complied a short list of some of the common food and ingredients that can contain gluten. They might not contain gluten, but most commonly they do unless otherwise stated. So please, always, always read those labels kids! So play-dough. I used to lick that stuff as a kid! Who hasn’t tasted play-dough, right? Please tell me I am right! It was so salty…and contained gluten. Better watch out! You can make your own though, so no worries! + What is your favorite burrito filling? Something traditional or something crazy?